Scholar, poet, and adventurer of doubtful origin, who appeared in Holland about 1670 and attracted much attention. He spoke Greek, Latin, Italian, French, and Dutch with equal facility, and was able to recite by heart whole classical works and to put into verse on the spot anything that was told to him in prose. He was thought by many to be an escaped monk from France, but Yung ("Alphabetische Liste Aller Gelehrten Juden . . . ," Leipsic, 1817) states that he was a Jew, a native of Eger, in Bohemia, who was educated in Vienna and in Italy. Bernich, or Berenicus, despised conventional scholarship and all the restraints of cultured life, and chose to associate with the lower classes; working sometimes as a chimney-sweep, and sometimes as a grinder of knives and scissors. He was found dead in a swamp, in the outskirts of Rotterdam, into which he had probably fallen while in a state of intoxication. Two works from his pen—one a collection of Latin poetry with a Dutch translation (Amsterdam, 1692; 2d ed., ib. 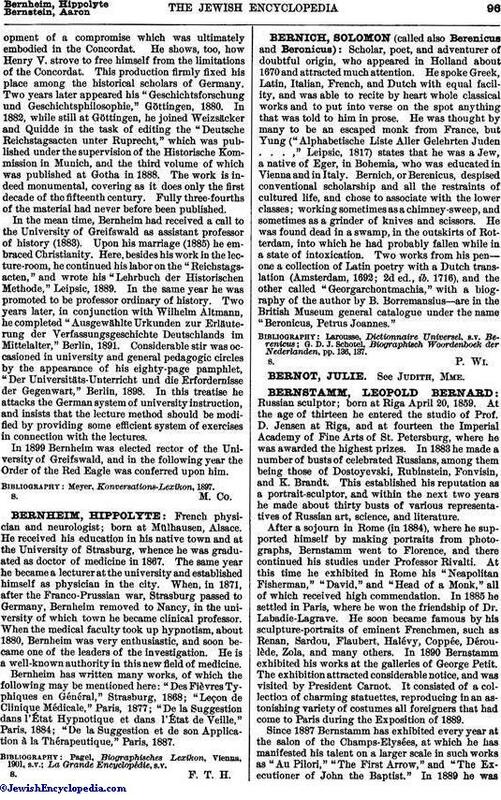 1716), and the other called "Georgarchontmachia," with a biography of the author by B. Borremansius—are in the British Museum general catalogue under the name "Beronicus, Petrus Joannes." G. D. J. Schotel, Biographisch Woordenboek der Nederlanden, pp. 136, 137.